There's something about the late sixties as a pinpointed time in American history that provided a run of amazing cinema. 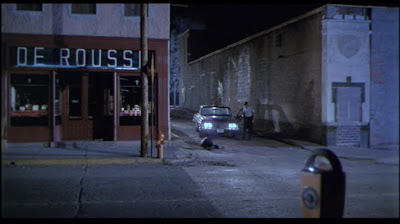 A part of it was the stateside recognition of the French New Wave (which I learned about while researching Easy Rider and which I really need to read more about), but more responsibility can be assigned to the tumultuous political and social environment at the end of that decade. 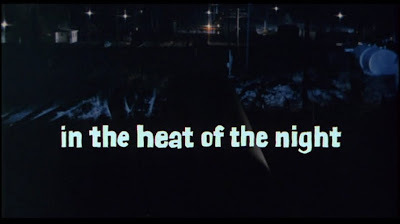 How else could a landmark film like Norman Jewison's In the Heat of the Night be made? So far on this list this era is seeming to produce the most memorable films for me personally (I'm thinking particularly of The Last Picture Show and Easy Rider) and this one is right up there. Company: just little ol' me again. Cuisine: luckily I've broken out of my prolonged sickness, and somehow lost eight pounds from not being able to swallow much during that bout with tonsillitis. Now I'm in a super healthy phase, so today's lunch is baked tilapia with a toasted garbanzo salad I picked up from the Wedge and a Divine Grape kombucha. Delicious. Somewhere in there I also devoured a banana with peanut butter. Has a flavor combination ever produced more joy? We open with Ray Charles. Would that every film did. 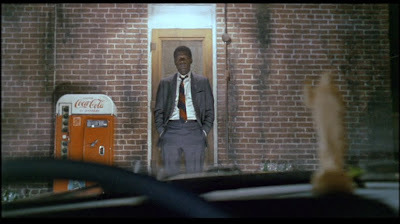 The title song, as well as the fantastic jazz score by Quincy Jones, is such a specific choice for this film -- a film that sees a lone black man in a small, ignorant and unimaginably racist white Southern town is underscored by a type of music that's so easily identifiable with the African-American experience. This detail alone puts us on Virgil Tibbs' side from the start, but we don't see him until after we've been introduced to a murder case, headed by the police chief Gillespie (Academy Award winner Rod Steiger). 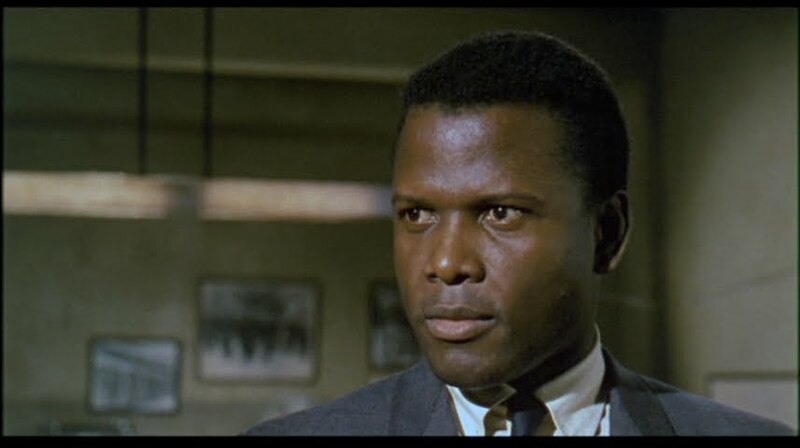 For no other reason than the color of his skin, Virgil Tibbs (a fierce and exciting performance by Sidney Poitier) is suspected as the murderer, but embarrasses everyone when he points out he was passing through the town after visiting his mother, and more importantly, that he is a police officer himself. 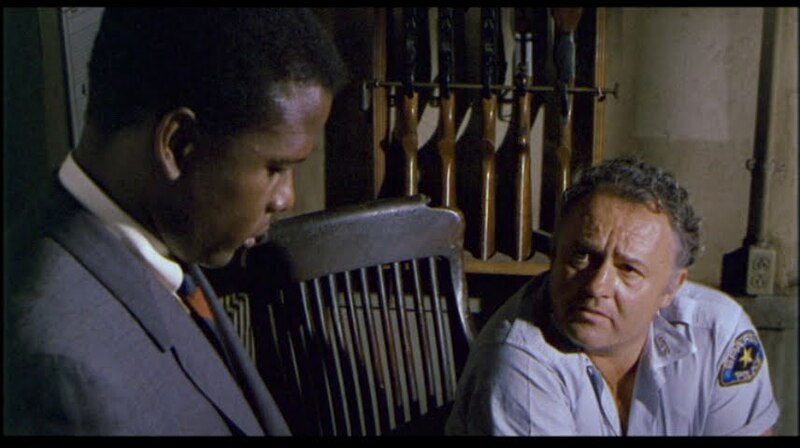 I suspect Gillespie hasn't seen many black people in Sparta, Mississippi, much less had prolonged contact with them, and so he looks appropriately fascinated when he discovers that Tibbs is not only a police officer (and paid much more than him besides), but Philadelphia's premiere homicide authority. Suddenly, for him and for us, the tables have turned. For obvious reasons, Tibbs is eager to leave the town, but when Gillespie admits they could use his help, you sense the whole civil rights movement's sharp intake of breath. For a white man to lay himself vulnerable at the feet of a black man, well ... it's 1967, babies. This means business. 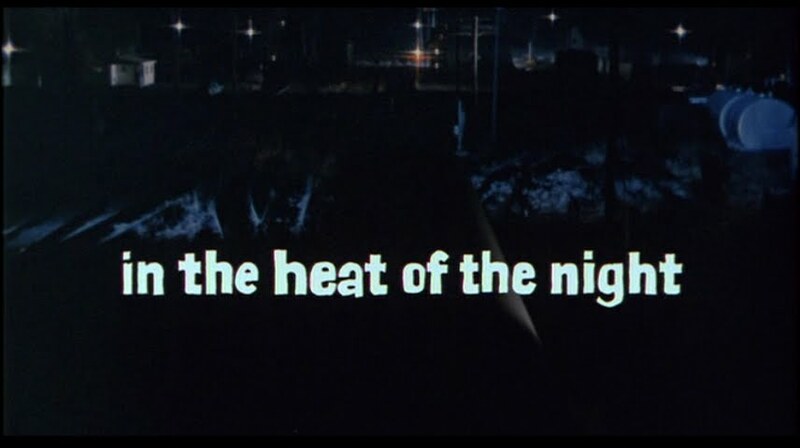 What follows is a modern-day film noir mystery thriller, following the cops through the duration of the investigation, but of course what makes the film so different is the overlying racism present in every white person's eyes. How specific each character's reaction to Tibbs is: Mrs. Colbert, the wife of the murdered man, as she eyes up Tibbs in the police station; Sam Wood, the police officer who discovered the body, as Tibbs asks him to take him through the night of the crime step by step; Delores, an easy teenager, as she confesses a vital piece of information to Gillespie with Tibbs in the corner. These details make everything simmer. The slap heard 'round the world. 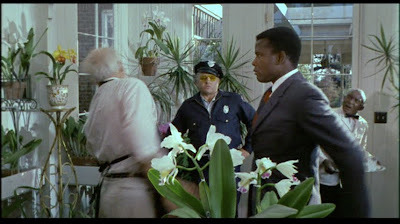 Then we come to perhaps the most memorable moment of the film, one that had huge implications on a cinematic audience in the heat of the late sixties: the moment when a suspect being questioned slaps Tibbs for insolence, and Tibbs, without missing a beat, slaps him right back. No matter how many times I see this scene, it's still so exciting. This was apparently the first, if not one of the first, instance of black retaliation without punishment committed to the screen. Supposedly this reaction is not in the book upon which the film is based, but it was included in the screenplay, and Poitier was quoted as saying "I'll tell you what, I'll make this movie for you if you give me your absolute guarantee when he slaps me I slap him right back and you guarantee that it will play in every version of this movie." How's that for transcending past cinema into politics and social concern? The heat is on when Gillespie refuses to punish Tibbs for his retaliation, and at this moment we sense a real turning of the dynamic between our two heros. We start discovering a lot more about him -- he's alone, without a wife or children, in a town that feels it doesn't really need him -- and it figures he's the kind of guy who's used to being right. But all his worst fears are summed up in Mr. Tibbs -- not only his racist tendencies but also his fears and insecurities about his job and what he thinks he knows about the human condition. The scene at his house confirms all this, and we see that while he's got a long way to go, he's being opened up bit by bit. 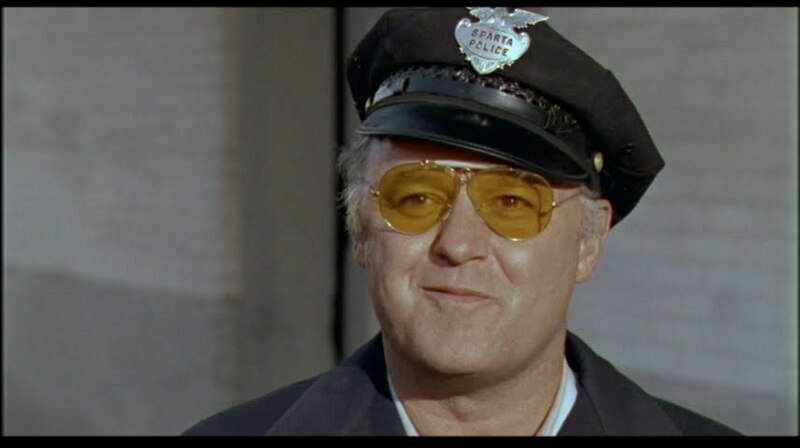 He gets his redemption at the end of the film, when the case has been closed and he bids Tibbs farewell as he catches his train. "Virgil ... you take care, you hear?" With a hint of a smile we see he's gained respect for a man he originally thought nothing of, and that maybe his audience in 1967 could find it in their hearts and minds to do the same for their fellow man. The film was an enormous success, thanks largely to the star performances of Poitier and Steiger, and won Best Picture of 1967 over formidable opponents (among them The Graduate and Bonnie and Clyde, both on the list, and Guess Who's Coming to Dinner, also dealing heavily with racism). It stands today as both a well-crafted thriller and an important reflection of a deeply wounded and divided nation. Tonight, the next: break out the fava beans and the nice Chianti folks, because it's time for your favorite serial killer mastermind and mine. #74 is The Silence of the Lambs.